Green Bay upset Valparaiso 99-92 in overtime in a wild Horizon League semifinal on Monday night. Valpo had tied the game at the end of regulation on a full court hail mary inbounds heave, but the Phoenix were able to rebound and emerge victorious in an extra frame. What happened on the court was only a fraction of the wild action, though, as Green Bay radio announcer Matt Menzl was temporarily dismissed in the second half. Update: Here’s the audio of Menzl’s ejection, via Scott Venci at The Green Bay Press-Gazette. And here’s how it looked in real time via some tweets from people at the game. Looks like the official is trying to get the Green Bay announcer thrown out here in the Horizon League semifinal. Isn't moving yet. This would be a major problem for the folks listening at home because Menzl was apparently doing the game solo. So after Menzel was tossed, Oakland announcer Neal Ruhl stepped in and picked up the microphone. He's gone. Oakland's @nealruhl steps in to call the rest of the game for the Green Bay radio network. For those curious, the officials were displeased with the gestures of our radio talent. Asked him to leave, he has since returned. For the record, all a misunderstanding tonight. Ref said I waved him off and without warning said he wanted me removed. I was let back in. Menzl said [referee Pat] Adams thought he was waving him off after a call went against the Phoenix. Adams thought overwise. “I talk with my hands,” Menzl said. “I was trying to describe that we had two guys fighting for the ball, and he took it as I waved him off, like saying that’s a horrible call. 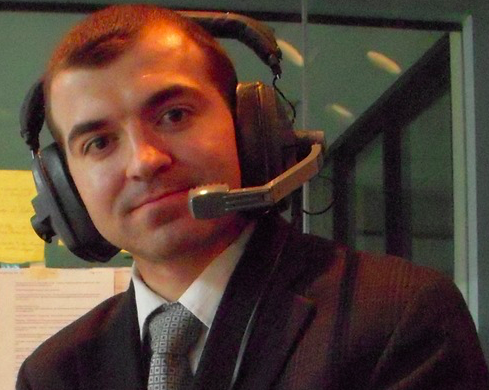 Menzl had to hand over his headset to an Oakland play-by-play announcer and went into the tunnel, where he explained the situation to UWGB athletic director Mary Ellen Gillespie and Horizon League spokesman Bill Potter. Potter told Menzl to go back and that they’d deal with it.